I'm a newbie in Devart. I'm trying to connect to a Sybase DB on a remote server that I can reach through a IPSEC VPN. What does it mean? Where is "Status param"? 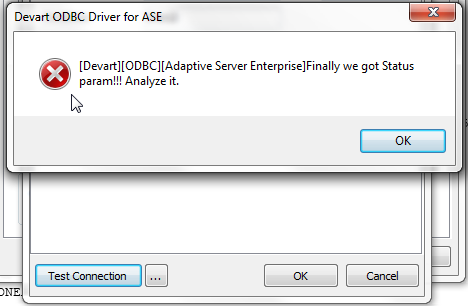 Please specify the version of Adaptive Server Enterprise you are trying to connect to. Can you establish a test connection to this server without using our driver (using the Interactive SQL utility)?